Activist Ashley Graham is an inspiration to all. As a plus-size model, she has become ‘the first’ to do many things in the beauty and fashion industry, from gracing the cover of Vogue US and Sports Illustrated, to signing a beauty contract. These firsts have instilled a confidence and reassurance in women everywhere that we are beautiful. No ifs, buts or maybes. With the weather getting that bit colder and assignments piling up, it’s important for us students to look after ourselves. Take note from Ashley Graham’s healthy lifestyle and we should survive another semester. The model recently ran through her morning routine with Elle and it’s just what you need to make a 9am lecture with a smile. Graham wakes up at 7:45am and has a Bible study in bed. Basically any positivity in the morning will do. If a Bible verse isn’t your cup of tea, try these uplifting Instagram accounts: @theslumflower, @bodyposipanda and @i_weigh. Moving onto skincare, Graham stresses the importance of giving your skin and body the nutrients it needs and takes Vitamin C and B12 every morning. She moisturizes daily using the Zao organic moisturizer, which Graham admits she bought solely from beauty bloggers’ recommendations, relatable. That being said, it’s quite difficult to get your hands on in Ireland and not to mention pricey. 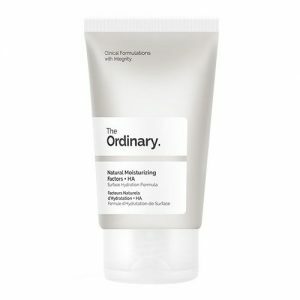 Instead, try The Ordinary’s natural skin hydrator for €5.39 (available from Beauty Bay). A fraction of the price with all the benefits. In the video with Elle, Graham revealed she is always running 15 minutes late, so don’t feel guilty for swanning into your lecture a little late. Now that your skin and soul have freshened up, it’s time to add a little touch of makeup. “You have to feel and look your best to go out into the world and slay,” according to Ashley. Amen. She loves the ‘no makeup’ makeup look and opts for simple everyday makeup. Seeing as Graham is signed to Revlon, most of the products she uses are from the brand. Great products for an affordable price, just what the student ordered! Keeping with a natural makeup look, Revlon’s ColorBurst Lacquer Balm (€11.49, Boots) is worth a try. I recommend the shade ‘Coy’ for Ashley Graham luscious lips. Last year the model branched out to add a clothing line to her resumé. Her collaboration with Pretty Little Thing went down a treat with items still available now. Graham focused on creating pieces suitable for all shapes and sizes with stock ranging from UK 4 to 28. Incredible! As we approach Valentine’s day, I’ve pulled a night out look together from her line, ideal for whatever your plans may be. The black long sleeve cowl neck bodysuit from the PLT line is the perfect dress up or dress down piece for any wardrobe (€28). Pair it with the leopard print mesh maxi skirt (€18) for an extra splash of sass, as done on the site. Finish the look off with big gold hoops (€6) and matching gold heels (€28), just as AG wears. All available from Pretty Little Thing; one order from bed and you’re done. Final pointers for the Ashley Graham lifestyle, eat well and go to bed early. She’s a big fan of green smoothies and eating as much veggies as she can. She opts for dark chocolate as her snack, just make sure you don’t get hooked and end up eating the whole bar!